Hmmm…I honestly don’t know who came up with these. I mean, I can only imagine the corporate focus group that came up with this oddity. 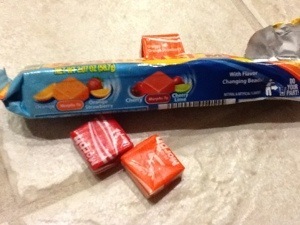 These are candies that are supposed to start as orange and cherry then magically add strawberry and lime flavor…really, did anyone ever say “these orange chewy candies are missing strawberry?” No, they did not…ever. First, the candies are hard. They should start off chewy, but they are stiff. The orange flavor is decent, but I can barely perceive the magic strawberry. The cherry tastes like cough medicine, and the lime doesn’t make it better. 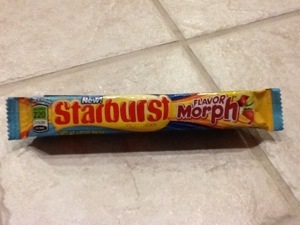 Now normally, I like Starburst, especially the tropical ones, but these are an insult to the brand. So steer clear. Posted in chewy candy, Don't bother, Fruity. Bookmark the permalink.